Most states in the U.S. are experiencing hotter than average temperatures this summer, as The Weather Channel contributor Linda Lam articulated. While many people appreciate seasonal warmth, once the heat index reaches into the upper 90s and low 100s, you’ve got to admit — it’s quite challenging to stay positive when your body is struggling not to overheat. How’s a person to stay upbeat amidst sweltering summer heat? 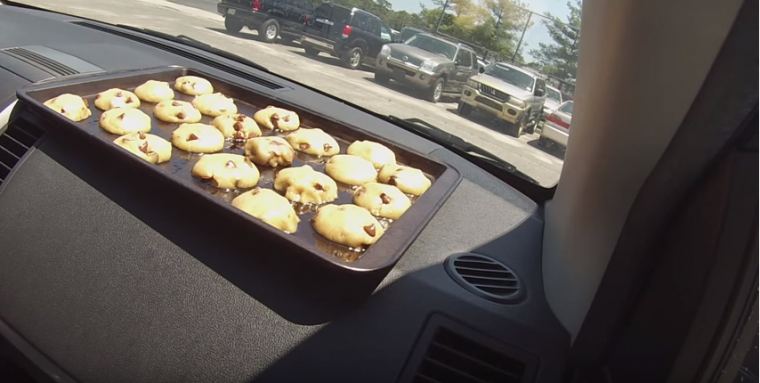 Well, baking cookies on your car’s dashboard is one tasty suggestion. A recent transplant to Virginia, Joseph B.B. Quinn, decided to take advantage of the searing temperatures to bake some treats on his car’s dashboard. If you’d like to follow in Quinn’s wake of positivity and try this culinary experiment for yourself, there’s a few guidelines to keep in mind. First of all, make sure the temperature outside is at least 95 degrees Fahrenheit. Next, park your vehicle in a sunny place during the hottest part of the day, which is usually from 1-4 p.m.
You can use a pre-made dough or a homemade type of whatever flavor. Though, it’s a good idea to use dough with pasteurized egg whites, to help minimize the risk of getting salmonella. Portion the dough onto a greased baking sheet and place the sheet on your vehicle’s dashboard. Put a towel underneath to help protect the surface of your dashboard. Set a thermometer next to the baking sheet, to monitor the car’s internal temperature while the confections are cooking. The inside of your car should read at least 180 degrees Fahrenheit. Let bake for at least two hours. Some batches could take as long as three hours. Reward your patience by sampling your freshly-baked dashboard cookies.